Since the inception of the November Nine during the 2008 World Series of Poker Main Event, few players have gone out of their way to promote themselves. Within the initial group of players, only Dennis Phillips went out of his way to talk to the media and create a buzz, and what happened? Hundreds of his friends, family members, and acquaintances flocked to Vegas for the final table and dressed exactly like him. Phillips is a name we’ve remembered since then, unlike tablemates Darus Suharto or Craig Marquis. In 2009, all eyes were on Phil Ivey. Barry Greenstein tried to get as much as he could out of Ivey for PokerRoad, but there were only a few episodes of Life of Ivey. The other November Niners were quite forgettable — in fact I’d lay 20-1 that the average poker fan couldn’t name the third-place finisher in under 10 seconds. The 2010 final table was very memorable, with Michael Mizrachi chasing the Player of the Year, the whole world waiting for Filippo Candio to explode, and Joseph Cheong running one of the most breathtaking bluffs of all time, but before the final table, only John Racener tried to create a brand. There was supposed to be a documentary released named On The Line about Racener’s life and the final table, but it was never released. In 2011, Ben Lamb was trying to cap off a great WSOP with a Main Event win, but Lamb didn’t go out of his way to talk with members of the media. Pius Heinz, a soft-spoken German player who told the PokerNews Podcast this summer that he didn’t prepare at all for the final table, beat out Martin Staszko, who talks even less. Neither player made the rounds prior to the final table. There is a three-month window between Day 7 of the Main Event and the final table. I don’t know why these players, knowing that there’s a very little chance they’ll ever return to the final table, don’t take full advantage of the opportunity they’ve been given. This isn’t to say you have to train everyday or constantly contact every member of the media, but do something. Enter Russell Thomas, who has not only done something, but also has paved the way for WSOP Main Event Final Tablists to come. After making the Octo-Nine, Russell Thomas contacted poker pro Jason Somerville and asked if he’d be interested in coaching Thomas. The two played together during one of the earlier days in the Main Event, and Thomas liked Somerville’s approach to the game. Somerville came up with a couple of ideas that Thomas liked, the two agreed upon a price, and off they went. Over the past few months, the two have been working on Thomas’ approach to the final table, and the training has intensified in October. Somerville, Thomas, and a host of other poker players including Leo Wolpert and Matt Berkey have ascended upon Stony Brook, New York, for the closing stretch. Over the next few weeks, the crew will simulate the final table dozens of times to prepare Thomas for different scenarios. Thomas doesn’t want to be surprised by anything. Thomas and Somerville deserve a ton of credit for taking the bull by the horns. This is a once-in-a-lifetime opportunity, and no matter what happens on Oct. 29, Thomas will know that he did everything possible to prepare for the final table. Also, while the documentary will always mean a lot to him no matter where he finishes, if he wins, then it will become a must-watch for various audiences — not just poker fans. There are countless television viewers who would stop flipping through channels if they saw a documentary about an actuary who binked $8.5 million in a poker tournament. I am excited to see the next few episodes of the documentary leading up to the final table, and regardless of Thomas’ finish, I’ll watch the entire production some day. Good luck to Thomas and Somerville. On Monday, Full Tilt Poker announced that Tom “durrrr” Dwan and Viktor “Isildur1” Blom will be joining Gus Hansen as members of the new team of ambassadors. Collectively, they will be known as “The Professionals,” and the new operators are sticking with the classic theme of black dress coats and black and white photos. Blom didn’t — he hasn’t tweeted since Aug. 1 — but his fans were excited for him over on TwoPlusTwo. This move, even though you could see it coming from a mile away, makes a ton of sense. Railbirds love to watch Blom and Dwan battle at the highest stakes online, and knowing that these two players trust the new operators, other big money players will follow suit. The big question remaining is who else from Team Full Tilt will return to the team? Hansen and Dwan make sense because Hansen lives outside of the United States and Dwan is always in Macau. If no other former members are retained, who else will join The Professionals? It’s widely speculated that Phil Ivey will join the team, but I don’t see it. Unless Ivey is given a big piece of the pie, he’s not going to take a sponsorship deal. He cares about his money — and only his money. Most of the other members of Team Full Tilt reside in the United States, and PokerStars has scooped up all the other major notable players. Does Full Tilt go young? Do they get players from PokerStars? Do they snag a player at the WSOP Main Event final table? Phil Galfond seems like a sensible choice, but after his recent breakup with Bluefire Poker, he may not be interested. Sam Trickett is a big, unsponsored player in Europe, but will he give up his free time and numerous trips to Macau for a patch? Will John Juanda be willing to wear a patch after all of the infighting he experienced over the last few years? Think I’m wrong? Have a better prediction? Go ahead and make it in the comments section! After a two-month hiatus, Daniel Negreanu is ranting again. His No. 1 target in this rant is, to no one’s surprise, Howard Lederer. If Kid Poker ever goes busto — I’m not betting on that — and you need someone to clean up your mess, then give him a call. Negreanu crushes Lederer some more, calling him “stupid” and a “roadblock” between the owners and Ray Bitar. Toward the end of the video, Negreanu teases the next episode of The Rant, where he plans to talk about Phil Hellmuth’s win at the WSOPE, and Haralabos Voulgaris’ blog that I mentioned in last week’s Five Thoughts. As always, Negreanu pulls no punches in this episode of The Rant, but I wish there was more him and less archived footage. If viewers wanted to hear opinions from other people, then they would go seek out other people. We want to hear you, Daniel, so let it rip. Having two or three segments of archived footage is fine, but for the most part we came to watch you rant. I am very excited to hear Negreanu’s response to Voulgaris’ blog, and to hear him talk about Hellmuth. According to Hellmuth, he talked strategy with Negreanu, so Kid Poker will be able to give us some good insight into Hellmuth’s approach to the WSOPE Main Event. While in Europe for the WSOPE and EPT Sanremo, our own Donnie Peters had an opportunity to sit down with Jason Mercier to talk about backing in the poker world. Peters led with a very good analogy, comparing the incomplete information in poker to the incomplete information in the poker industry. Just like a player who doesn’t know his opponent’s holdings, we as members of the media don’t always know who’s staking who. Often we have an idea where the money is coming from and who the big time backers are, but there are still a lot of mysteries. Not to mention, the average fans who watch ESPN and the casual players tend to have no clue. Some of them think Antonio Esfandiari risked $1 million of his own money and earned a full $18.3 million. Three of those backed friends are Allen Bari, Dan O’Brien, and Brent Hanks, and O’Brien is currently Mercier’s only horse. Mercier was tableside when Bari and Hanks won their bracelets, and congratulated them as friends, not just as a backer. In Cannes, France, when O’Brien fell just short of his first bracelet, Mercier was crushed not just because he missed a big payday, but because his friend was so close. Many people say money and friends/family don’t mix, but isn’t it important to trust the player that you’re backing? If you don’t like the person, and all you do is hand them money to participate in poker tournaments, doesn’t that make the business process more difficult? In the real world, when office workers hate their boss, don’t they perform worse? In sports, if your coach isn’t supportive, isn’t it really difficult to go that extra mile? Having a good relationship with a business partner is paramount. I don’t want to say that backers who are scammed deserve to be, but if you give money to a stranger, aren’t you throwing caution to the wind? Staking is extremely important in poker because it supplements the economy within the industry. If the players on the circuit didn’t sell shares or weren’t backed, the poker economy would fizzle quickly. I hope people unfamiliar with backing take a look at Mercier’s interview with Peters and are very cautious when establishing deals, but I certainly think staking is key for poker’s survival. Let’s limit the scammer threads while increasing player pools, shall we? Ludovic Lacay took down EPT Sanremo last week. He and Jason Lavallee reached heads-up play and made a two-player deal, but the two played for an extra €100,000 and the trophy, which Lacay won. Lacay locked up a total of €744,910 ($961,807), which was the largest score of his career. 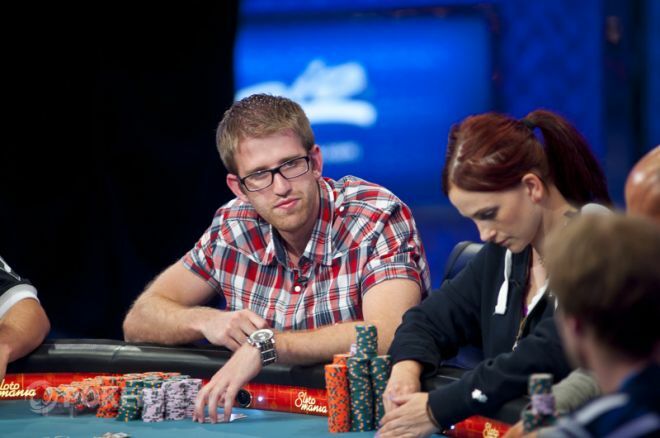 His previous largest score came in 2009, when he finished 16th in the WSOP Main Event ($500,557). Lacay now has just under $3 million in total career tournament earnings, and two live tournament victories — he shipped a €1,500 Barriere Poker Tour event ($50,596) in 2009. The win was big for Lacay, who before the event hadn’t had a score greater than $17,097 since September of 2011. It was also his first six-figure score since July of 2010, where he finished fourth in the WSOP $10,000 Pot-Limit Omaha Championship event ($262,208). Team Winamax has been crushing as of late — six months ago, Davidi Kitai took down EPT Berlin and Gaelle Baumann bubbled the WSOP Main Event final table.